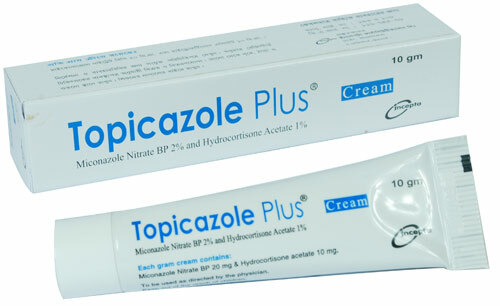 Topicazole Plus Cream: Each gram cream contains Miconazole Nitrate BP 20 mg & Hydrocortisone Acetate BP equivalent to Hydrocortisone BP 10 mg.
Phycomycetes, Ascomycetes and Adelomycetes (e.g., Saprolegnia, Candida, Cryptococcus, Aspergillus, Dermatophytes, Phialophora, Sporotrichum), and Trichophyton mentagrophytes, Trichophyton rubrum, Epidermophyton floccosum. Trichophyton interdigitale and Microsporum canis. Miconazole nitrate also possesses some anti-bacterial activity against Gram-positive organisms. Hydrocortisone acetate is a mild topical steroid which reduces inflammation, swelling, redness and itching of the skin. It is indicated for the treatment of fungal skin infections such as sweat rash or athlete's foot when additional symptoms of inflammation (such as swelling, redness and itching) is present. It should be applied topically to the affected area twice daily. Rub it in gently until the cream has disappeared. Do not use the cream for more than 7 days. After using the cream wash hands carefully to avoid spreading the infection to other parts of the body or to other people. Generally it is well tolerated. An allergic reaction to any of the ingredient of the cream may occur. Rarely, irritation & burning may occur. It should be used with caution when applied to extensive surface areas or under occlusive dressings including baby napkins. Application to the face should be avoided. During pregnancy and lactation, this medication should be used only when clearly needed.